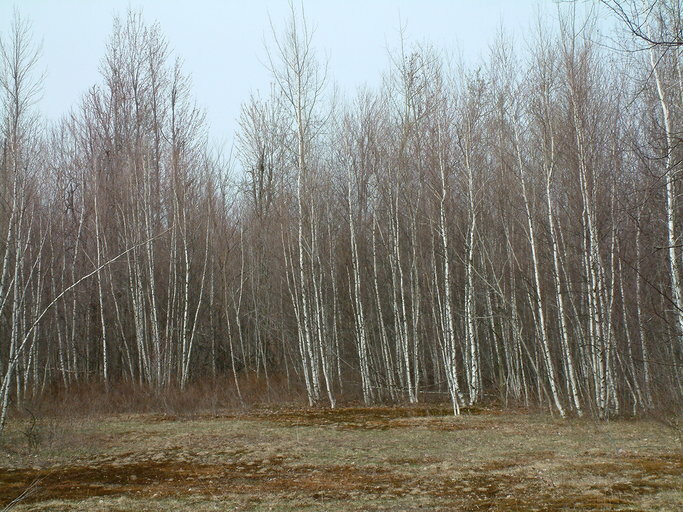 Betula populifolia is a small tree to 10 m; usually with multiple stems, trunks mostly less than 15 cm diam., mature bark very white with black chevron-shaped markings at each branch base, as well as numerous black horizontal lines (lenticels), bark of young trees and branches red-brown, shiny, with pale lenticels, bark not peeling; colonial from root sprouts especially if damaged; fast growing, short lived. Leaves alternate, 5-8 cm long, triangular, tip tapered to a long point, base truncate, margin doubly toothed, except base; leaves expand mid-May; winter plant leafless 166 days (Britton 1874). Flowers monoecious, male flowers in catkins to 3 cm long, female flowers in shorter, stouter catkins; blooming April; wind pollinated before leafing out. Betula Populifolia.fruit.Karren Wcisel © 2005 (Accessed 11/2016). Fruit winged nuts, to 0.3 cm, ripen, Sept.-Oct.; wind dispersed, Oct.-midwinter. Seeds &/or buds and catkins eaten by birds and small mammals (Martin et al. 1951). 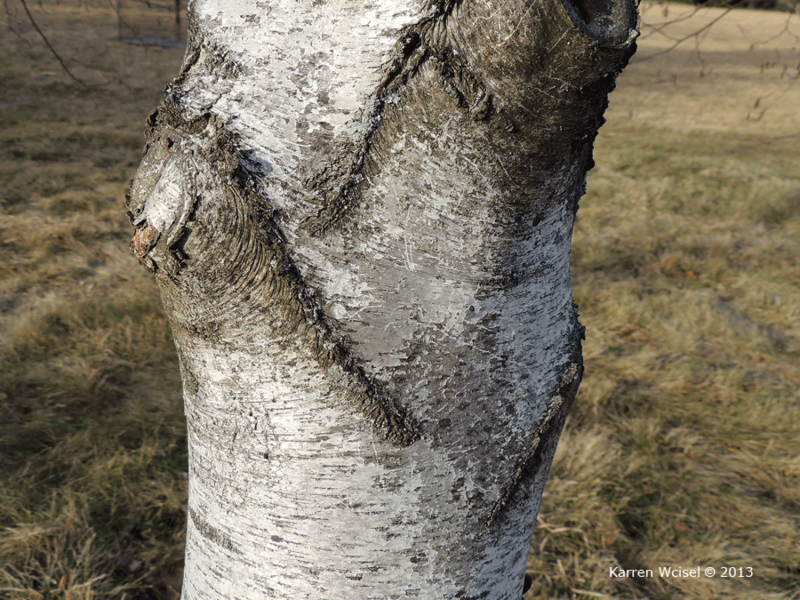 Betula populifolia.mature bark.Karren Wcisel © 2013 (Accessed 11/2016). Habitat: Open, nutrient poor, acid to circumneutral mineral soils, pH 3.5-7.5 (USDA, NRCS 2010). A pioneer species. Tolerant of salt, sterile, sandy fill, ozone, soil compaction, drought, and intermittent flooding or saturated soil up to 75% of growing season. Very intolerant of shade, index 1 (Hightshoe 1988). Especially in burned over forest, and disturbed areas, reproduces prolifically on bare soil often forming dense stands. Growth rate fast, 9.24 (relative to 0.99 for sugar maple), high growth rate found to correlate well with shade intolerance (Grime 1965). Typically mixed with Smilax and Sassafras on old burned areas. Also found along wetland edges, sometimes growing on tussock sedge (Carex stricta) hummocks in marshes (personal observation). Notes: Twigs eaten by deer & rabbits (Martin et al. 1951).Sometimes infected by the anthracnose Gloeosporium betulinum (syn. Discula betulina, Deuteromycotina, Coelomycetes), which kills leaves. The symptoms of this disease are brown patches surrounded by yellow tissue on leaves. Dead trees are often colonized by a bracket fungus with a smooth, white, rounded fruiting body, Piptoporus betulinus (Basidiomycotina), the birch polypore. This is common on many species of dead birch. 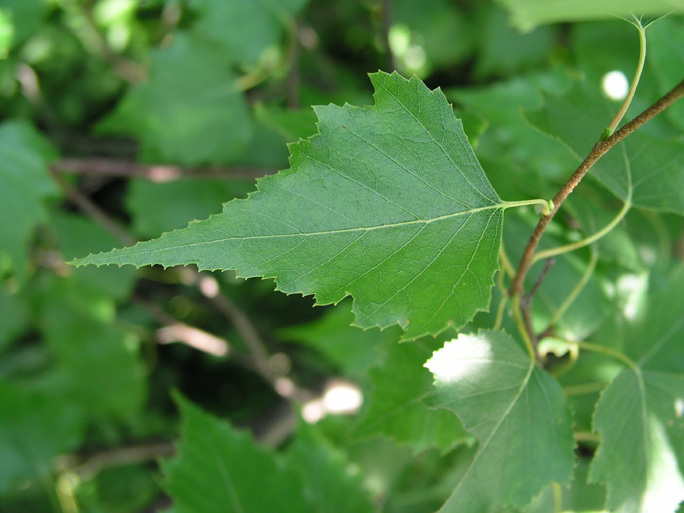 Gray birch is attacked by the birch leaf minor, (Fenusa pusilla), the larva of a European sawfly that is very common in North America. Female sawflies lay eggs on newly developing leaves. The larva is flat and eats the soft middle tissues of leaves, eventually killing them. Adult sawfly is 0.3 cm long, the larvae up to 0.6 cm. Three to four generations may occur in one growing season. Attacks over several years will seriously weaken trees. 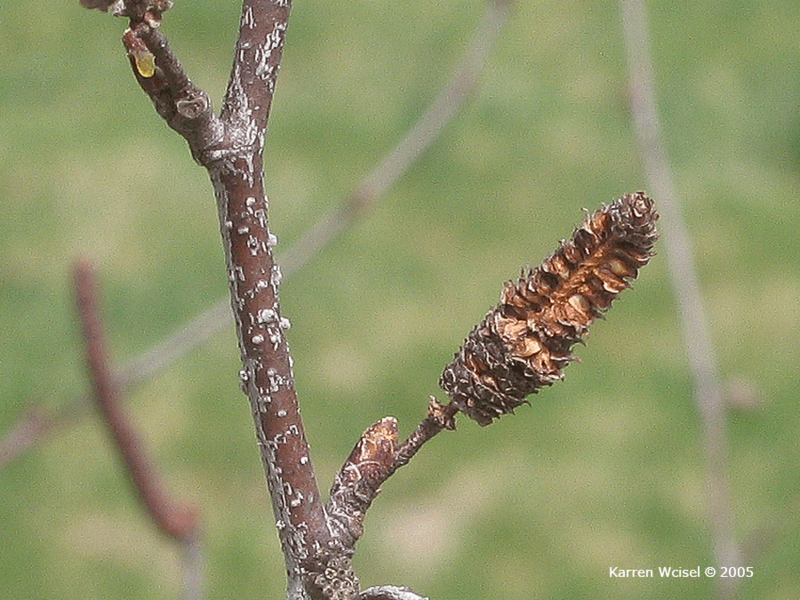 Gray birch is also host to one stage in the life cycle of Hamamelistes spinosus, a gall aphid. Adult female aphids over-winter as pupae on birch. As leaves open in spring, the aphid reproduces rapidly. Birch leaf undersides become covered by the grayish aphids that cause a corrugated appearance of leaves from bulges between major veins. Some aphids produce wings and migrate to witch hazel, their second host, to lay eggs. After reproducing in a gall formed on witch hazel buds, another generation of aphids fly back to their second host, birch (Dirr 1990; Hightshoe 1988; Johnson and Lyon 1991, Sinclair et al. 1987). Larvae of the tiger swallowtail butterfly Papilio gaucus; mourning cloak butterfly, Nymphalis antiopa; cecropia moth, Hyalophora cecropia; luna moth, Actias luna; promethea moth, Callosamia promethea; polyphemus moth, Antheraea polyphemus; imperial moth, Eacles imperialis; four-horned sphinx moth, Ceratomia amyntor; small-eyed sphinx moth, Paonias myops; Paonias myops; white-marked tussock moth, Orgyia leucostigma; Virginia tiger moth, Spilosoma virginica; Lepidoptera, also eat gray birch leaves (Opler 1992; Tallamy 2003).